Exceed efficiency of current approved transport modes by 5 times. Exceed the safety of existing modes. ASTM Interentation F24 are used by most State Departments of Commerce to police theme park rides and owners. At JPods we think of theme parks as communities designed around pedestrians. There are powerful thrill rides, but they must be design to both please their riders and be safe to riders and pedestrians. Theme parks have an injury-rate of 0.2 per million. A side from a excellent safety record, there is a century of well established common law. Building privately owned JPods networks to this standards creates a known cost of regulation and legal compliance. Using this standard should eventually make traveling and walking in cities as safe as theme parks. Morgantown's PRT network is also self-regulated with a zero injury-rate since it openend in Trish Nixon did the ribbon cutting in Oct 1972. This self-regulated behavior prevents replicating the success of Morgantown by privately owned mobility networks. Automated People Mover (APM) standards by American Society of Civil Engineering (ASCE) regulates people movers such as at airports. This standard has been used to deliver systems to government agencies that have sovereign immunity, it lacks long standing common law of the ASTM. DOTs are self-regulated with a death-rate of 106 per million. DOTs' death rate and DOTs protecting their existing transport networks from free market competition by PRT since Morgantown underscore why Commerce Department of State governments should regulate private mobility networks using their existing expertice with the ASTM standard. This is a very simplified way to measure the waste that can be turned into profits and customer savings. Multiplying the applications of power (start-stops) times the kinetic energy of the moving mass divided by the payload mass the constants and velocity squared cancel to provide a relatively simplified formula. Cute summary of the defect in this ad from Uber. Two costs must be considered, those capitalized into the price of the actual transportation and those socialized into pollution and resource depletion against the welfare of Posterity. 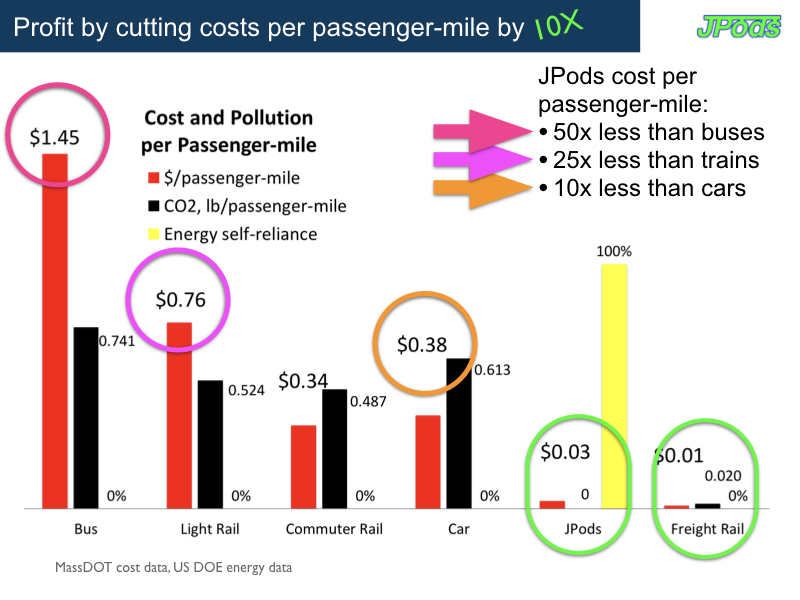 The following graph uses MassDOT data to compare cost per passenger-mile and pollution per passenger-mile for various modes of transportation. Solar-powered mobility networks have no operational pollution and much lower cost of operation. Mass transit buses produce more pollution per passenger-mile than cars. Mass transit trains are nearly as polluting as cars. Net Energy: Economically useful energy per unit of energy required to obtain that energy. Oil used to be 100:1 but has depleted to 3:1. 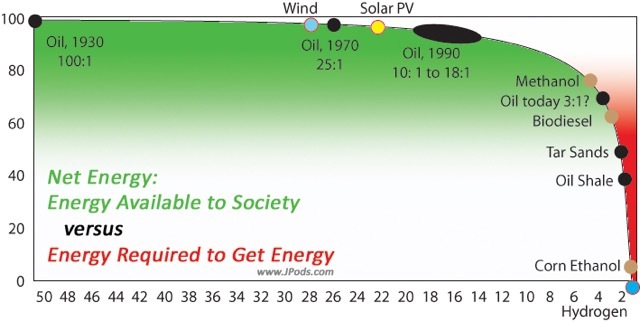 Solar is 25:1 for wind and 20:1 for photovoltaics. Very good 18 minute summary of Energy Economics. Candidates and policies that support improved Net Energy will create jobs from surplus energy. Food Metrics: A typical person needs about 2,000 food calories, or 2,000 kcal per day with little physical activity. This equates to 2.33 kWh or 1 megawatt-hour per year. People who are physically active it may be significantly higher (30 – 150% more). Energy Consumption: The typical American uses 88.5 megaWatt-Hours of energy per year. Cutting all energy use 45% would put the average American at 48.7 megaWatt-Hours, or roughly the same as the 47.2 megaWatt-Hours used by the average German. Economic Work: energy and transportation should thought of aspects of creating and delivering economic value. The physics definition of work is force applied to mass. 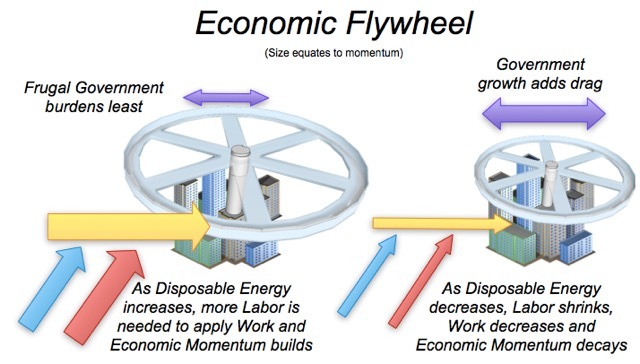 The economy is a momentum artifact, a flywheel of labor applying energy to produce, store and distribute energy. Life requires energy. If I had a choice, money would be back by energy, not debt or gold. Ref: "Is the technology off the shelf ready?" 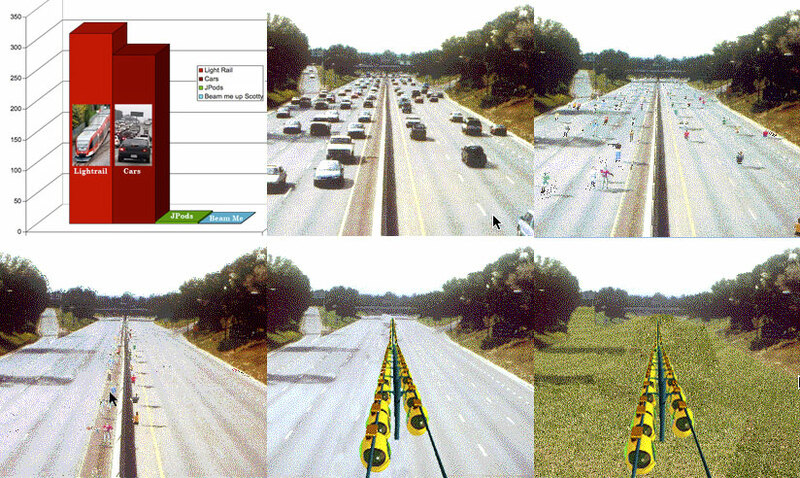 The Personal Rapid Transit (PRT) network built in Morgantown, WV as a solution to the 1973 Oil Embargo has delivered 110 million oil-free, injury-free passenger-miles (link to video, Congressional Office of Technology Assessment study PB-244854, audit and letter from the Mayor of Morgantown). Hyperloop and ET3. Why are governments funding magnetic levitation of a thousand-ton train when a 400 pound pod can be deviated in a vacuum tube and travel using 1/50th the energy. Disposable Energy: How much energy can people buy with their take-home-pay. How much energy can people afford to pursuit happiness? How much energy can labor buy to apply to building enonomic momentum. The energy behind the US dollar is depleting at the rate of 1 million barrel per day per year. The Law of Supply and Demand has been clear since US Peak Oil in 1970. As US oil fields depleted gas prices ratched higher at an average of 7.3% per year, 14.1% since China and India became significant importers in 1998. Note that US Federal debt increased in tandem with oil imports. It is likely gas prices will jump much higher as the dollar loses its monopoly in the world oil-trade. China is to force the Saudis to start trading in the Yuan. Saudi Arabia announced their $2 trillion “Post-oil Era” fund. China announced a $50 trillion solar grid. There is a $100 Trillion Shift From 'Just-In-Time' To 'Just-In-Case’ energy. Changing the lifeblood of American from oil to ingenuity will create millions of jobs, save families a car payment per month. 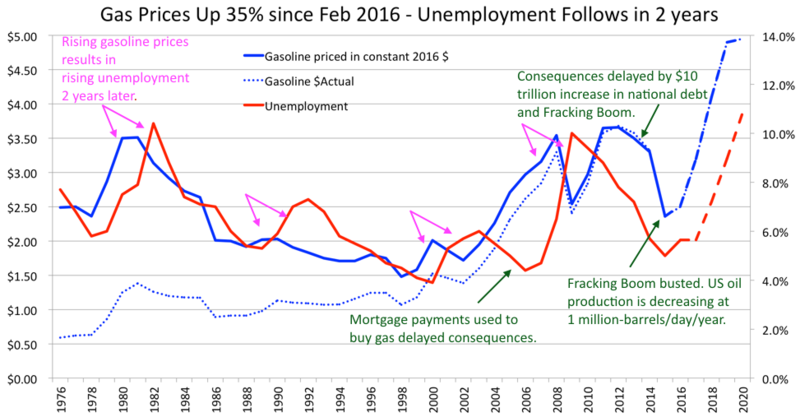 The risk in America is that the crisis of 2008 will repeat by between 2017 and 2020 as gas prices crush jobs. Since Peak Fracking in June 2015 the US has the equivalent of one 1973 Oil Embargo less energy. By 2017 this will be three. It will be a nightmare. Recognize Illicit Energy, dependence on energy outside self-reliance. Federal support for Illicit Energy from foreign oil repeats the Path to War of Federal support for Illicit Energy from slavery. Face the brutal fact that US Peak Oil was in 1970. Paddle a canoe, build a water wheel. Railroads in the 1860s allowed the extraction industries to scale from $100 a barrel for oil to $3. JPods and other solar-powered mobility networks will result in displacing fossil fuels with solar. It requires a 10x cost savings for people to change their habits. Luck for use, solar-powered mobility networks have cost savings of 10x (over cars) and 10x to 50x (over mass transit). People will vote for policies that increase jobs and save them a car payment per month. As with the near century of rotary dial telephones under Federal monopoly, the barrier to transportation innovation is the unconstitutional Federal highway monopoly. Here is a 2006 Fox News story on the gargage quality JPods network.